If you’re completing your Duke of Edinburgh award, one of the most essential pieces of equipment you will need is a good trekking rucksack. 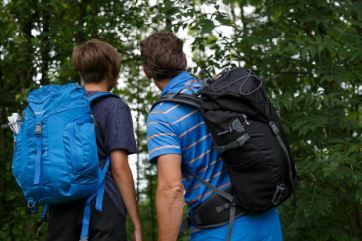 However, finding the perfect backpack can be a little overwhelming: with a seemingly endless number of styles, sizes and shapes to choose from, where do you start? 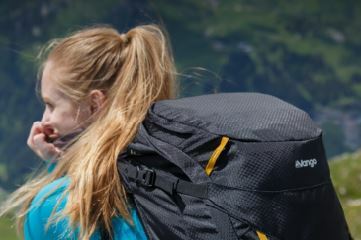 Rest assured, there’s a rucksack tailor made to fit all your outdoor adventures - whether you’re spending a day adventuring the craggy splendour of the Trossachs or on a week-long expedition exploring the Isle of Man, let us help you find the perfect one! 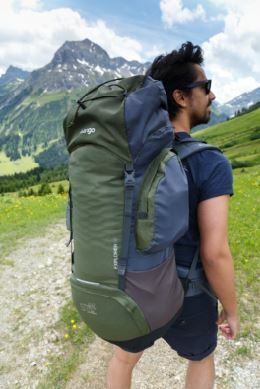 Take with you the bare necessities, particularly on multi-day treks – packing that extra pair of boots might have seemed like a good idea at the time, but you’ll regret it when you’re forced to lug them around for miles at a time. Navigation – a map, compass or GPS device will ensure you stay on track! Sun protection, if you’re trekking during clear skies. Illumination – a flashlight, headtorch and lamp will do better than munching carrots will. And don’t forget extra batteries! Fire! Bring matches or a Vango Fire Starter for instant warmth. Nutrition – Our Wayfayrer meals are packed with all the best nutrients to keep you going. Hydration – water bottles or hydration reservoirs are essential, and being close to a clean water source can come in handy. Emergency shelter – Particularly in conditions with adverse weather conditions, our Storm Shelter will keep you safe. It’s essential that you make sure your rucksack fits you perfectly. If it’s too large or too small, weight will not be evenly distributed and will put pressure on different parts of your body, making hiking and trekking a painful task rather than a memorable journey. AirAdjust Back System – This vented back system allows the user to adjust the harness to fit. It can be found in our daysacks. A1 Back System – An evolution of the self-adjust back system, this is built around two body contoured alloy bars. The shoulder harness can be adjusted with one hand to fit almost any back length perfectly! This can be found in our Pinnacle rucksack. Self-Adjust Back System – Based on our patented A3 system, SA is robust, highly tested and will fit just about any back length. 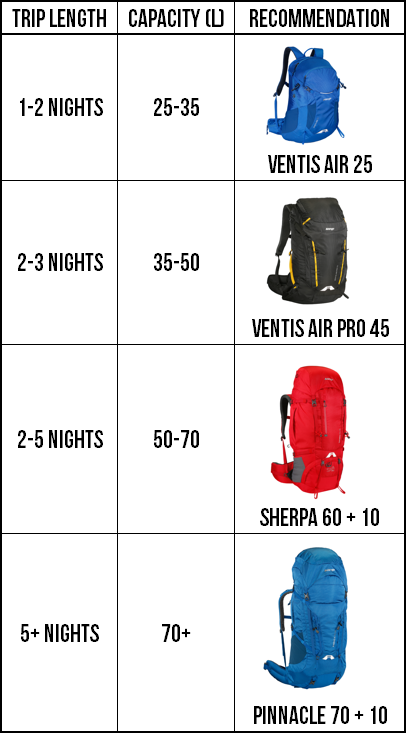 It can be found in our Sherpa rucksack. Quick Adjust Back System – Coupling a controlled alloy frame for load distribution with a webbing ladder arrangement for back length adjustment. The quick-step system offers uncomplicated adjustment, comfort and durability. It can be found in out Contour rucksack. Lastly, look out for bags that have add-ons that will suit your trip. Most rucksacks come with a number of additional features that are well suited to a host of different activities – for example hydration compatible packs come with a drinking straw exit hole, ideal for staying hydrated during a run or trek. If you’re carrying precious cargo, bags that come equipped with a rain cover ensure that during storms you can attach and pull it over your pack to keep your gear safe and dry. A padded hip belt is a necessity for when you’re on a multi-day trek, and will make your journey much more comfortable.